There's a killer loose in the garden. It's silent and invisible, with superpowers that overwhelm any rose it infects. Rose rosette has been marching across North America for decades mowing down roses at an alarming rate. This viral disease is carried by an almost invisible eriophyid mite called Phyllacoptes fructiphylus and the results of infection are devastating. It was first identified as early as 1941 in Wyoming when farmers noticed that the imported multiflora rose they were using as natural fencing was infected. That's right, the invasive and destructive Rosa multiflora that has caused so much havoc with farmers and natural areas is especially susceptible. This plant was originally imported from Japan as a natural barrier and for erosion control in the late 1700s. Birds quickly spread the seeds and it soon became a major pest, especially in the eastern half of North America and currently 30 states report it on their Invasive and Noxious Plant lists. Conservationists were rejoicing. The microscopic mite, native to North America and spread by wind or touching plants was winning a battle that had been fought for decades. The only problem was, the celebration was somewhat premature. Our cultivated darlings and queens of the garden, were also susceptible. Until the last decade or so, rose rosette was not a disease that many gardeners were familiar with. It seems that the widespread use of the popular Knockout® roses may have helped it to gain a foothold in our gardens. Knockouts® are the perfect rose for the lazy gardener. They bloom all season, require little care and tend to be immune to most of the ills that plague their more delicate cousins. Gardeners embraced these great plants and because of their low maintenance, they were often planted in huge drifts by parks and in commercial landscaping. Here in my town, they surround the City Hall, banks, most churches, schools and even gas stations and convenience stores. Why plant a plain, green boxwood when you can have roses that bloom all summer, right? Most of these roses are planted in tight groups, to show off the season-long drifts of color. The effect is beautiful, and my town is lovely when they are all in bloom. Unfortunately, I've had to stop in at City Hall this week to inform them that the roses that are planted around our Court Square are infected. 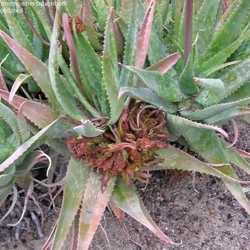 Symptoms of rose rosette include dark red new growth that appears malformed. Often the infected canes develop bushy terminal ends called 'witches brooms'. Blooms are distorted, often accompanied by excessive thorns, unusual leaf growth and uncharacteristically long lateral shoots. The virus travels down the cane into the roots of the plant and spreads throughout the rose. From the initial infection to ultimate death is estimated to be about two years. 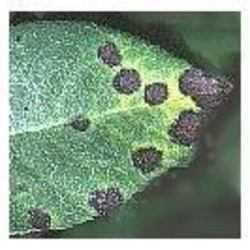 There is no known pesticide that controls this mite and the only treatment is to remove the plant, including the roots. While the mite does not live in the soil, traces of roots will remain, so roses cannot be replanted in the same area. It is a death sentence for the rose. Any domesticated rose is susceptible, so just because you do not have any Knockouts® in your garden does not make you safe. 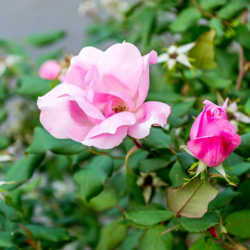 It is deadly for species and cultivated roses. Your neighbor's heirlooms are in just as much danger as the cheap hybrids the big box stores sell for just a few bucks. No rose is safe. Good garden hygiene will help control the spread of this killer. Avoid planting roses in tight groups, giving them at least six feet on center. Tightly massed foliage allows the mite to move from plant to plant easily. If you live in a rural area, try to remove any Rosa multiflora that may be lurking upwind in the fields and fence rows. Some experts advise pruning roses back by two thirds in early spring to potentially remove any mites that may have overwintered on the canes. Most people prune their roses each spring, but by being mindful of how this problem spreads, we can help control its progress. Always destroy pruned canes and leaf litter away from your garden. Be observant and quickly remove any plant that appears infected, being careful not to shake or brush the infected plant on your healthy roses. Some experts even advocate removing the surrounding soil if other roses are nearby. We should all take this viral threat seriously. It is only through education and diligence that we can protect our cherished roses. Learn the symptoms and report any infection to your County Extension Agent. Even if rose rosette isn't in your own garden, if it is in your neighborhood, your roses are at risk. Gardeners working together can get this serious problem under control. Sources used in this article and for more information on rose rosette.